This post is in partnership with Dreamworks Animation. All opinions expressed are my own. 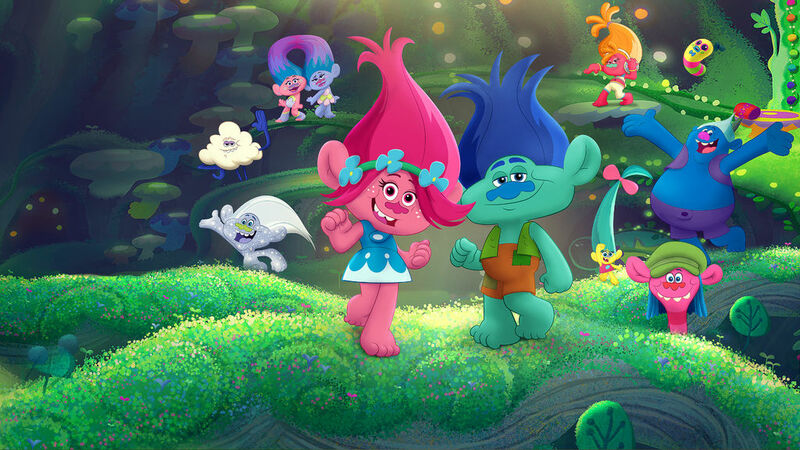 The first season of Trolls: The Beat Goes On, has officially landed on Netflix! Have you and your kids caught this newly released animated series? If you enjoyed the movie, you'll absolutely adore this new show from Dreamworks Animation! The kids and I have been having a blast watching the first season. The show basically picks up where the movie left off, with Poppy about to take her place as queen. 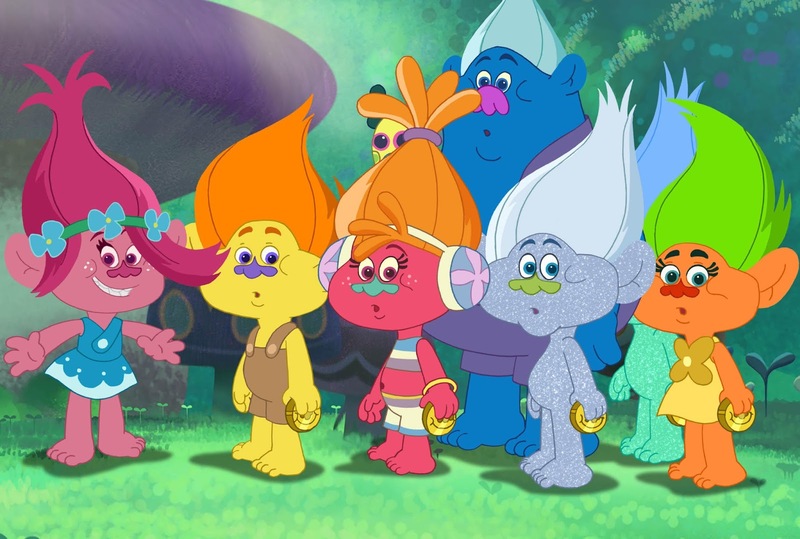 All of the beloved characters from Troll Village are featured in the animated series, too. From Branch, right down to Cloud Guy (and all of his hilarious antics! ); they're all back and ready to delight and entertain your family, with their colorful song-filled adventures! In celebration of our new favorite kids show on Netflix, we decided to make these cute non-candy Valentine's Day Trolls Slime Jars, with some super cute Free Printable Trolls themed Valentine's Day Gift Tags. Read on, for our simple tutorial, and to grab your free printable Trolls Valentine's. Plus, catch the official trailer for Trolls: The Beat Goes On! 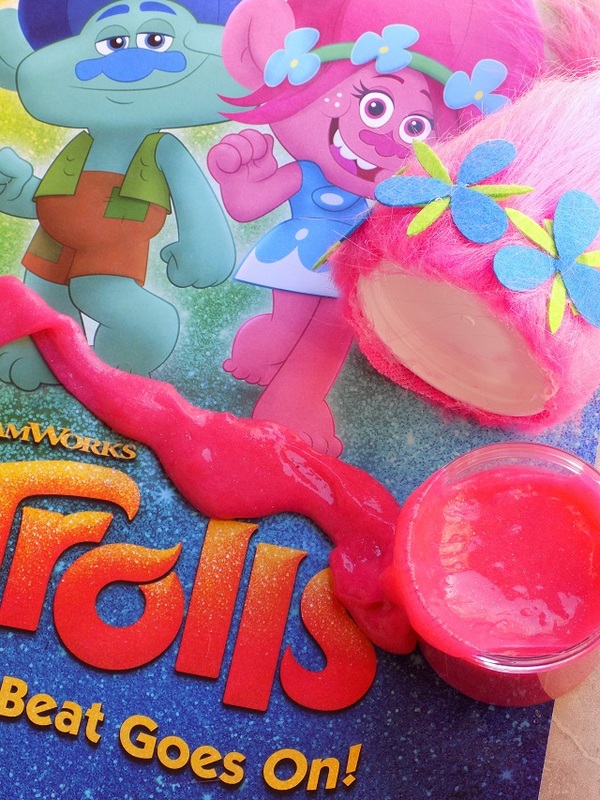 Optional: Printer paper, a printer, a whole punch, and twine/ribbon + Grab our free printable Trolls Themed Valentine's Day Cards / Tags, below to use your Trolls Slime Jars and Poppy Pink Glitter Slime as a cute candy-free Valentine's Day treat! Use heavy craft glue or a low-temp hot glue gun to secure the furry fabric around the perimeter of the jar lid. Use a large dot of heavy craft glue or low-temp hot glue in the center of the fabric - pinch in place for a minute or two to form the top point of your "Troll hair." if using heavy craft glue - use a rubber band to hold the furry fabric in place for about an hour / until the glue has had adequate time to dry. Use scissors to cut/craft small blue flowers, to create Poppy's flower headband. Use heavy craft glue or low-temp hot glue to assemble the flowers and affix them around the base of the jar lid (refer to images above and below. In a large bowl, combine glue, glitter, and baking soda. Stir mixture until well combined. Add pink food coloring to mixture, stir until well combined. Add saline solution, stir well until mixture forms into a ball of slime. Add an extra drop or two of saline solution, to create a firmer slime consistency. Add your slime, to your DIY Trolls Slime Jars, and enjoy! Store slime in your Trolls Slime Jar when not in use. Slime typically lasts about 2 weeks, when stored properly. 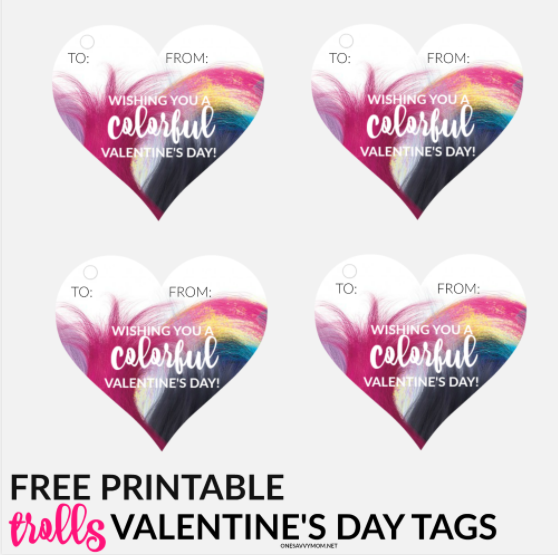 If gifting for Valentine's Day, download and print our FREE Printable Trolls Themed Valentine's Day Card / Tags, HERE. Use a hole punch and secure around the perimeter of your slime jar with ribbon or twine, and gift to someone special! Check out the official trailer for Trolls: The Beat Goes On, below. The first season of Trolls: The Beat Goes On is available now, on Netflix. This is a fun Valentine's Day favor. 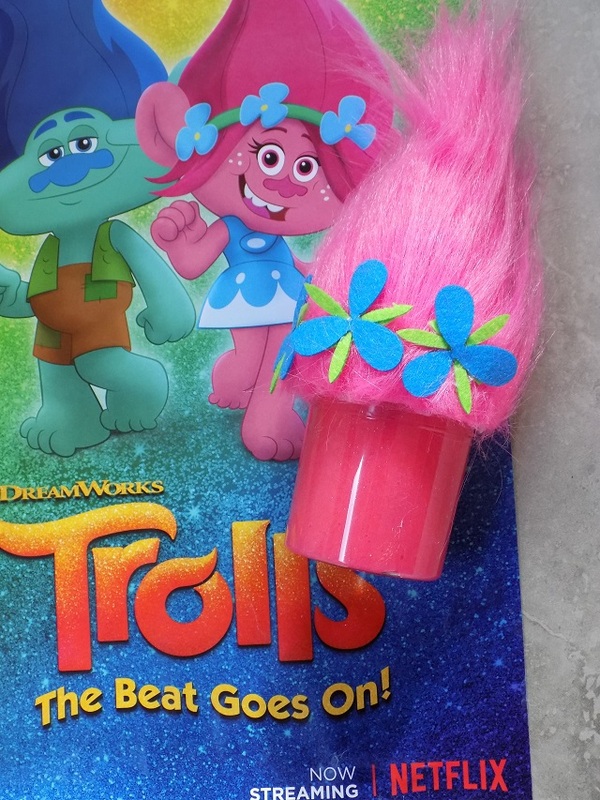 My daughter loves slime and I know she would enjoy the troll hair too. I love this idea for Valentine's day! It will be perfect for her class gift this year! Oh what a great idea! Our little has so much fun with slime....and I have to say...I do too! I have make these! How fun! I love Trolls and my niece and nephew would love this! Such a cute idea! My kids love slime; they'd make it every day if I let them. Thanks for sharing your recipe; I haven't tried a borax-free recipe yet, but have been meaning too. The kids so love the Trolls and would love to do this craft thanks for sharing this one.